The face of performance management is changing with organizations such as Microsoft, Deloitte, Accenture and General Electric streamlining their performance reviews, or even scrapping them. This trend comes from a growing perception that annual performance reviews might not be the best way to manage and improve performance in the workforce. Perhaps the question isn’t whether we should abandon performance reviews, but how can we make them better. Rather than treating it as a dreary exercise to comply with policy, we should think of how we, as leaders and HR professionals, can drive a culture of continuous feedback where every interaction can build commitment, engagement, and productivity. Recent research shows that 77 percent of HR executives believe performance reviews don’t accurately reflect employee performance; there is also not much evidence that performance reviews have a positive affect on business performance. Yet, that same research also indicates that one should not be in too much of a rush to scrap performance reviews or ratings. Many organizations that completely do away with performance reviews see productivity decline. What’s more, employees tend to rate their conversations with their managers lower in the absence of a formal performance rating. I believe what this shows is that some of us resist structure when it’s there, but crave it when it’s absent. Although scrapping performance reviews frees both employees and managers from a process that can be viewed as an unproductive use of time, it also means that the business lacks a formal process for linking employees’ goals and performance with the strategy of the business. It’s hard to be fair and consistent, without a formal process. 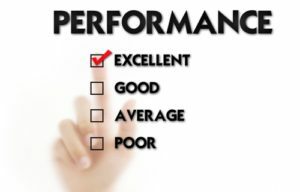 One answer that keeps coming up regarding the question of better performance management is that it should not be simply an annual process, but that it should allow for more frequent feedback. A recent PwC study showed 60 percent of survey respondents (and 72 percent of those under thirty) wanted feedback every week. This makes absolute sense. Employees should be learning all the time and their managers should be providing ongoing feedback and reinforcing positive behavior to ensure that employee performance is aligned with strategy. Below are a few ideas about how organizations can implement a more agile approach to performance management. Set clear expectations: Have clear performance goals linked to the overall business strategy with objective metrics so that employees know what is expected of them. Provide feedback more often: in addition to formal feedback sessions, encourage managers to have weekly or at least monthly check-ins with their teams. Keep it simple: get rid of those long performance review sheets and focus on the most important questions and metrics. Look forward rather than backward: rather than dwelling on past successes and failures, focus on what the employee can do to grow in his or her role and how the organization can support the person’s ambitions and performance. It takes considerable effort to build a high performance culture. We need to consider every interaction as an opportunity to influence employee’s performance in a positive way to build achievement of desired results, commitment and engagement. Please contact me at nlappley@lapppley.com or (847) 864-8979 to discuss any questions you may have from this eNewsletter. 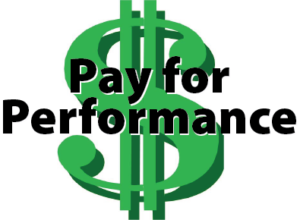 Many organizations profess to have a pay for performance compensation plan in place. What does that mean exactly? Does it recognize and reward the right employees? What the definition should be is that the right employee is whoever has performed well above the majority of other employees during the performance cycle. Those employees that the organization can rightly call high achievers. And those employees whose resignation would cause their manager to lose sleep at night. Everyone else should be treated differently. Well, that’s not how things work in many organizations. There are a number of other considerations besides performance alone. The result is that perhaps the right employee does not get rewarded. Or what they are given is not much more than what is also given to the average employee. Someone might quit: An employee quitting is often a manager’s worst fear and in this case, may lead to an interest in providing pay increases that would retain staff. Surely they suggest, “If an employee quits it’s more work for the manager and the potential for criticism from their boss. I want to be liked: “I want to be liked” is an attitude often prevalent among new managers, who want to build a collaborative team. They can be reluctant to make performance assessments and pay increases for their team. Many would blame human resources for not providing enough funds. They avoid career-impacting decisions: Some managers would prefer someone else play judge and jury with an employees’ career. Rewarding the right employee becomes essentially about the manager being willing and able to make discretionary decisions about an employee’s job performance and effectiveness as an employee of the organization. Because the budget for pay increases is always going to be tight, there will never be enough money for everyone. So an effective manager has to choose how to spend available reward dollars in a way that generates the best return for the organization.In some cases, this means that an average employee may not receive a merit increase this year, even if performance has been ok / satisfactory / meets expectations. Making these decisions is not easy. Nor is it supposed to be. My colleague, Rich Sperling, and I have spoken and written extensively on the topic of taking care of top performers and high-potential employees. Contact me and we will be pleased to share our thoughts with you. Please contact me at (847) 864-8979 or at nlappley@lappley.com to discuss discriminating pay among employees based on performance. And forward this email to anyone who may also be interested in this topic.